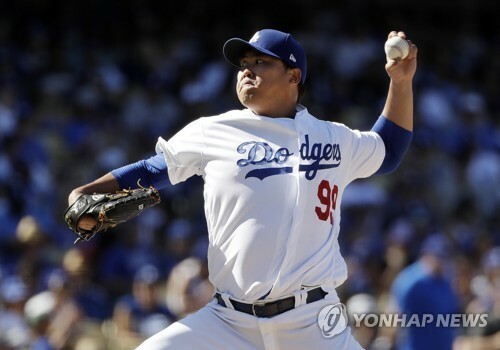 Los Angeles Dodgers' South Korean starter Ryu Hyun-jin has thrown his second straight gem to take his club closer to the postseason. Ryu blanked the San Diego Padres over six impressive innings, allowing four hits while striking out eight at Dodgers Stadium in Los Angeles on Sunday (local time). The Dodgers went on to rout the Padres 14-0. At 87-69, the Dodgers hold a 1.5-game lead over the Colorado Rockies atop the National League (NL) West. They have six games left after Sunday, while the Rockies, who defeated the Arizona Diamondbacks 2-0 on Sunday to stay close to LA, have seven more to go. Ryu has now tossed two straight scoreless outings, after holding the Rockies without a run in seven innings last Monday. The left-hander improved to 6-3 with a 2.00 ERA and 86 strikeouts in 76 1/3 innings. He threw 65 of his 88 pitches for strikes on Sunday. Ryu has a sparkling 1.93 ERA in 46 2/3 innings since returning from the disabled list. He missed a little over three months of action after hurting his left groin in a start against the Diamondbacks on May 2, but has come back even stronger than before. Ryu also flashed his offensive skills in the victory by batting 3-for-3 with two runs scored. This was Ryu's second career three-hit game and his first since April 13, 2013, against the Diamondbacks. It was Ryu's third start against the Padres this year. On April 16, Ryu held them to two runs on three hits in six innings, as the Dodgers routed San Diego 10-3. Ryu got another win over the Padres on Aug. 26 by limiting them to one run in 5 2/3 innings, though he did get knocked around for 11 hits in the Dodgers' 7-3 win. The Dodgers couldn't have asked for a better start in this one, as Ryu struck out the side in the top of the first inning. Ryu gave up a leadoff single to Eric Hosmer in the second inning but then sat down the next three batters in order. The Dodgers spotted Ryu two runs in the bottom second and Ryu retired six consecutive batters over the next two frames. The Dodgers exploded for six runs in the bottom fourth, with Ryu helping himself by hitting a single and later scoring on a David Freese hit. Down 8-0, the Padres tried to rally with back-to-back singles off Ryu to open the fifth, but the left-hander regrouped and retired the next three hitters, the final two by strikeouts. The Dodgers put up two more runs in the bottom fifth, as Ryu again singled and scored. That was more than enough run support for Ryu, who worked around a Wil Myers double in the sixth for another scoreless frame. Josh Fields relieved Ryu to begin the top of the seventh, and Julio Urias finished off the Padres with scoreless eighth and ninth innings.